Nordic4DFrame always likes to hear how school teachers and educators at museums and science centres are using 4DFrame materials with their classes or visitors. KomTek, a science- and technology-oriented activity centre in Järfalla, Sweden, has shared 11 different activities that not only go along with the school curriculum for grades 1 to 3 and 4 to 6, but are also fun to do. This exciting new interactive science exhibit - developed jointly by a consortium of museums and science centers around the Baltic - has now opened in Stockholm, where it will be available through January 2014. Besides the touring exhibit, another goal of this project is to create innovative materials for both teaching and learning in association with Helsinki University’s Department of Teacher Education. Nordic4DFrame is a part of this project as it also includes a traveling 4DFrame workshop that focuses on the subject of art in mathematics as a complement to the main exhibit. After January 2014 the exhibit will continue on to science centers in Cesis, Latvia and Tallinn, Estonia. One piece of recent good news is that the exhibit will probably also appear in Finland. This is more than appropriate, because research related to it is based at Helsinki University. This year’s Hands On! Conference (7 to 11 October) was held at three main museum sites in Stockholm: The Swedish Museum of Science and Technology, the National Historical Museum and the Swedish Museum of Natural History. The Conference’s themes of exploring technology, creative learning and the world of exhibitions were covered in over 30 seminars, presentations and workshops. Over 177 delegates from 22 different countries were represented from children’s museums, museums and science centers from around the world. A one-and-a-half hour long introduction about how 4DFrame is used in classrooms was presented by Nordic4DFrame Managing Director Mariana Back. 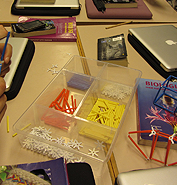 Held in the Swedish Museum of Science and Technology’s own 4DFrame workshop, it was attended by about 30 curious and enthusiastic international participants as part of the afternoon’s elective activities on 8 October. Nordic4DFrame Managing Director Mariana Back and board member Professor Aadu Ott spoke at the “Symposium on the Public Understanding of Science” held 27 September at the Innovatum Science Center in Trollhättan, Sweden. Mariana spoke about her experiences with informal education while working at Borlänge’s The Future’s Museum, and currently at the Swedish Museum of Science and Technology in Stockholm. She also reported on a co-operative project among countries in the Baltic designed to stimulate student’s interest in math and technology as well as about the use of 4DFrame as an interactive educational tool in such a project. Aadu Ott’s talk focused on how modern brain research along with information and communications technology fundamentally alters our view of both the form and the content of "scientific literacy." Ott talked about today how we challenge old ideas about learning and instead work to let learning take place under the brain's own terms. National honors continue to come to 4DFrame. Their pre-school program, “Creative Math and Exploring Science,” was recently selected for the Korean national pre-school curriculum by the Institute of Child Care and Education. 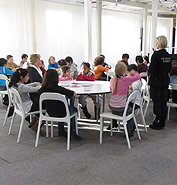 What happens when four museums and science centers in Estonia, Latvia and Sweden team up with the Helsinki University Department of Teacher Education? 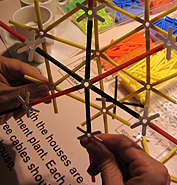 An exciting new touring exhibition, “Discover the Art of Math,” that will tour to their organizations around the Baltic Sea in 2013 and 2014. The goal of this project is to create an interactive science exhibit as well as to produce innovative materials for both teaching and learning. And Nordic4DFrame is a part of this as it includes a 4DFrame workshop that focuses on the subject of art in mathematics as a complement to the main exhibit.